Everyone knows the captain’s word is law on board ship but, say the well-fed passengers, it is executive chef George Streeter who steals everyone’s heart (and stomach). LESLEY BELLEW joined Saga Pearl II find out the secret behind George’s exceptional fine dining menus. George Streeter is not just good with the housekeeping money, he is a genius. He would not dare skimp on what he and the Saga passengers consider ‘absolute-must’ British favourites and when Saga Pearl II loads at Southampton or Dover he is on the quayside to ensure every order is delivered. Cadbury’s hot chocolate, HP sauce, Heinz tomato ketchup, Branston pickle and Tiptree jam arrive by the pallet-load and are always on his list. George is a stickler for quality and personally checks all of the fresh produce. He said: “If the fruit and veg are not up to scratch I make sure we have replacements before we sail. “It is so important to pack the storerooms and freezers carefully for the whole two weeks; it is no good accepting anything less than 100 per cent. “If we are on a longer cruise we have to work with our agents to get more supplies at other ports. Some countries are better than others when it comes to reliable deliveries and loading so we pack in as much as we can. “Obviously it would not be so easy or economical to buy British goods when you are halfway round the world. Saga Pearl II offers two dining area options; the main Dining Room with waiter service which seats up to 320 and the self-service Verandah which caters for up to 170. Seating is open and there is one sitting. George said: “Although there is a choice of dining style, the same meals are served in both areas. The menu does not differ – just because some people choose to eat in a more casual environment it does not mean they miss out on the quality.” Saga chefs have the freedom to create menus around their destinations and enjoy plenty of flexibility to be inventive. They do not have to keep to a two-week rolling menu, supplied by a head office, like many cruise ships that have to cater for thousands of passengers on one sailing. “That can be an easy job, just repeating menus, but boring for the cooks!” said George who loves to surprise his passengers with different menus. “I’m good with my budget,” laughs George as we go shopping for wolf fish in Bergen. The fish market is a glistening sea of produce next to the water’s edge, selling everything from whale meat to smoked cod. 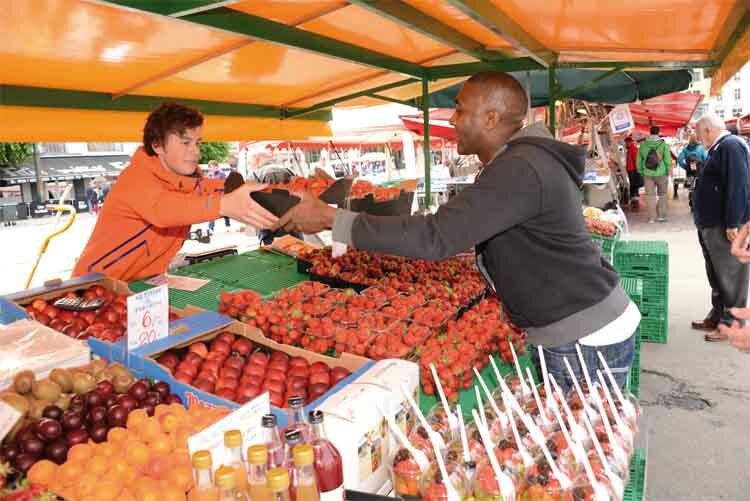 George still has some change in his pocket and at a fruit stall he picks out fresh strawberries and with his permanent winning smile politely asks for a better deal. Instead of taking the discount he opts for an extra two boxes of the sweet-smelling fruit. He stops to taste moose and reindeer salami at another stall. “The passengers will like to sample this,” he said and snaps up half a dozen of each, with a few jars of cloudberry jam for the evening’s Nordicgastronomic f east. “Flexible, free-style cooking within a menu set every two weeks is so much more exciting and challenging,” said George as he strode back to the ship laden with the produce. Within minutes of being back on board the wolf fish had been washed and preparation was under way. 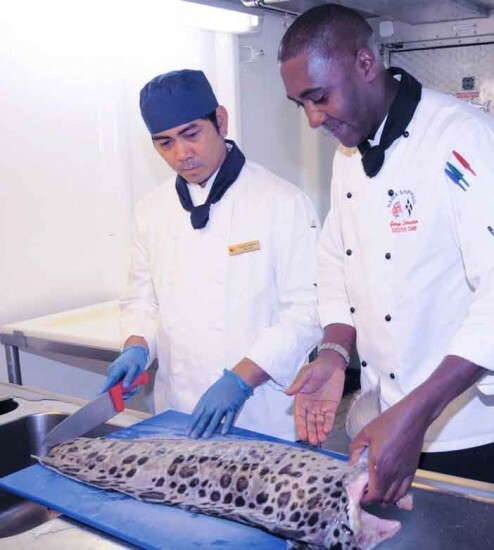 George oversees the filleting and leaves his assistant chef to slice the fish as he has instructed. In the evening, before any meal goes out, George briefs his 40-strong team on how he would like to see the dishes presented. A ‘tester dish’ of each menu is plated up and he, alongside his assistant chef, discuss the meal and suggest perhaps a tweak to the ‘presentation’. George said: “My team know how I like dishes served. Mostly I only need to suggest a little more seasoning or a touch more sauce so everything is perfect. “Once I did find celery, instead of rhubarb, had been used in the crumble. We all fell about laughing and quickly prepared a new batch so the passengers had the correct dish!” George also requires Maitre D’ Kirsten Olette’s team of waiters to appreciate each menu and briefs them to ensure they are able to talk authoritatively to guests about their choices. Kirsten said: “When the dining room opens at 7pm, we can have 300 people to serve within about an hour. Everyone has to know exactly what they are doing and when the passengers ask about a dish the waiters can answer with confidence. Passengers Bryan and Bridget Pearson, of Grassington, in Yorkshire, say they are ‘true fans’ of George’s cooking. Bryan said: “The restaurant offers five-star dining every night. We just can’t wait to see the menu every evening. “We loved the Scottish night – the fried Mars Bars were brilliant. “As far as my wife and I are concerned, George is the power behind the throne on this ship!” It was no surprise that passengers wolfed down the special fish dish. Steve Leavett and Erica Fielding, of Carmarthenshire, both love the adventure side of cruising. 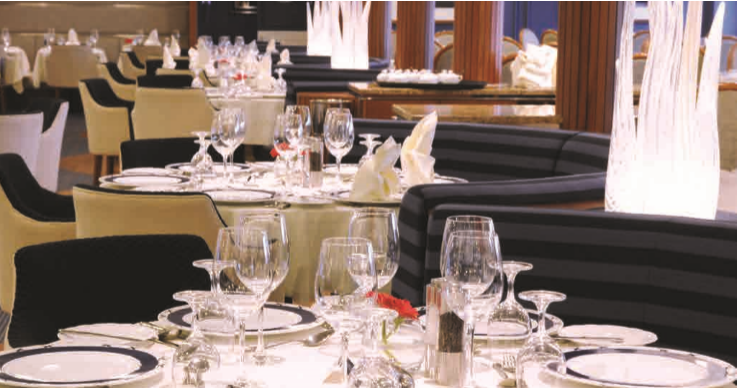 Steve said: “The cuisine on this ship is exceptional. Erica said: “The Norwegian menu was such a treat. It is so good to try new dishes and the wolf fish and lobster is not something we had tried before. 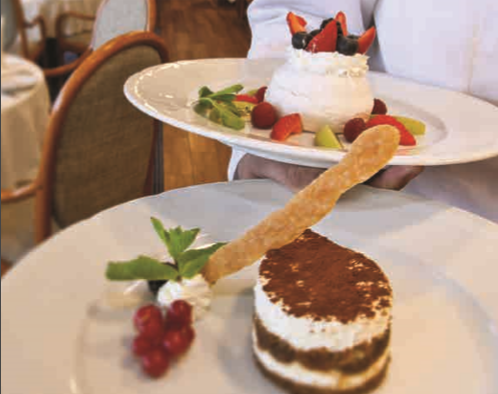 It was superb, beautifully presented and it tasted even better than it looked.” Antiques Roadshow expert Clive Stewart-Lockhart added: “I have sailed with several cruise lines but George is the only chef I know who regularly works the floor. He really uses his shoe leather and you always see him in the dining room chatting to guests, asking them if their meal is ok. The guests love talking to him and always ask him for cooking tips! He is exceptional. The bosses are pleased and the passengers keep returning – it seems George not only sails on water, he walks on it!